Part I - What's PVM? to Windows, from PC, Workstation to MPP). -The first part is a Daemon , called pvmd3 and sometimes abbreviated pvmd , that resides on all the computers making up the virtual machine. - The second part of the system is a Library of PVM interface routines, which contains a functionally complete primitives needed for cooperation between tasks of an application. be created/terminated across the network and it also can communicate and synchronize with other tasks. solution, output, and display. 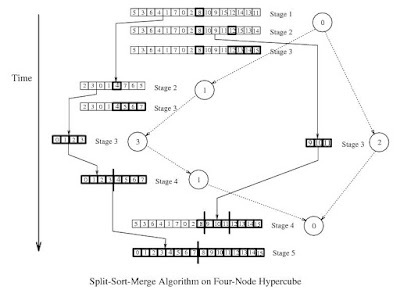 This process is often called functional parallelism . A more common method of parallelizing an application is called data parallelism . In this method all the tasks are the same, but each one only knows and solves a small part of the data. PVM supports either or a mixture of these methods. relationship exists among the tasks. - Hybrid Model, combine the upper to models. typically assigned by the master (statically or dynamically). in addition to contributing to the computation itself. the master pvmd and kept synchronized across the virtual machine. 2. Some host manipulation operations involves several hosts (for example, host addition), so 2-phase commit/3 phase commit protocol is applied (master is the coordinator). the message to the corresponding send queue. 1. A user writes one or more sequential programs in C, C++, or Fortran 77 that contain embedded calls to the PVM library. machines in the host pool. Generation->Runtime Library, and choose "Multi-Threaded(/MT)"
I wrote some Pvm applications, trying to build and run it will be a good start to Pvm journey. Let's focus on the technical difference of the two system. Both are based on message passing model and can support SPMD(Single Program Multiple Data) /MPMD(Multiple Program Multiple Data) pattern. 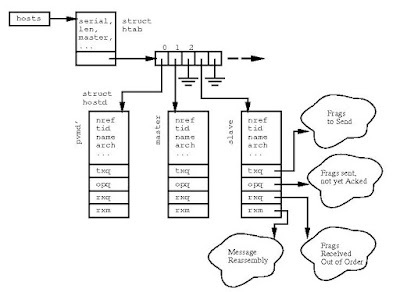 But MPI is treated as static model, where process communication happens in static manner. For example, tasks are regarded created statically with no failures. at runtime. And node failure is also within consideration. 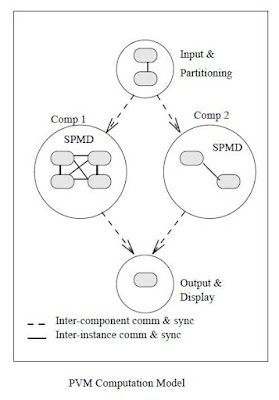 What's more, PVM provides the conceptual view of virtual machine, which consists of various nodes. and don't have such concepts. faster than that of PVM. The initial MPI standard doesn't contain specifications on how to create/destroy process/tasks, later improvements(MPI 2) add related APIs. MPI3 is considering check-point based failure handling features. 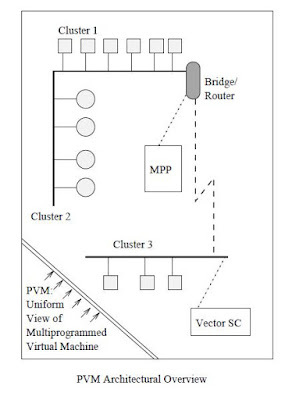 PVM is designed for heterogeneous and dynamic environment, it provides a virtually uniformed conceptual view. While MPI is mainly designed for high performance and source code level portability. Reference  are very good material on this topic. more powerful and its concept and architecture is beautiful. computers, dynamic and failure handling is not that important. good, since performance optimization is not its main focus. no more porting pains any more. Both sides are very happy. for its long term survival. users will have the requirement to integrate many such system? talk to other competitor's similar product. 23. Why are PVM/MPI so different?